These USS Monitor plans are probably the best offered anywhere. The plan was CAD generated and converted to pdf. The zip file is downloaded here and contain three sheets in 1:48, 1:72 and 1:96 scale. 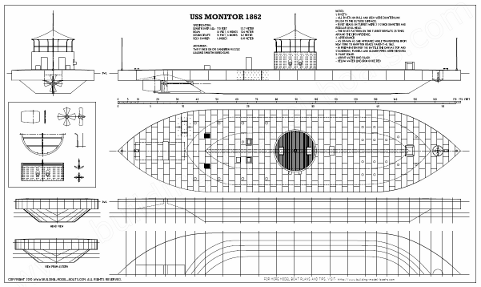 USS Monitor plans - This is a low-resolution image of the plans available in three different scales - 1:48, 1:72 and 1:96. 1:48, 1:72 and 1:96 scale in a single zip file. I didn't have any USS Monitor plans when I built my first model of the famous ironclad. I think I was 14 at the time and I used a very simple illustration from a coffee table book to build from. The result was anything but accurate, but I finished it and ran it with RC on the local lake. It was mostly made from balsa with an old candy tin for a turret. There is no doubt that this early attempt to build a model of the USS Monitor made a permanent impression on me. Anyways, here is a little report on how these plans came about. I started researching online and found the plan that is available from the Naval History and Heritage Command. It shows the overall shape pretty well, but I wanted more details and the resolution isn't all that good. So off I went to the Monitor Center in Newport News, VA. The Monitor Center is integrated with the Mariners' Museum, even though the artifacts belong to NOAA. Convoluted, I know, but if there is one place to go to research the USS Monitor - this is the place. Adjacent to the building is the full size replica of the USS Monitor. It's not the most detailed replica you'll ever see, but it certainly gives you an idea of the size and general appearance. Off I went with my notebook and tape measure. The turret of the USS Monitor was recovered by NOAA in 2002. The conservation process has been going ever since. The iron has rusted, and to stop the deterioration, all salt has to be removed from the now porous and brittle material. After having been on the bottom of the ocean for 140 years, the dents in the turret from the battle with the CSS Virginia were clearly visible. Pretty amazing. One-eyed Jack? 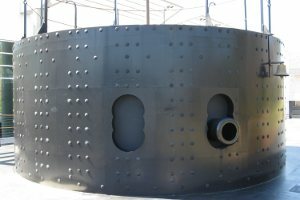 No, this is the turret of the USS Monitor full size replica at the Monitor Center. They believe the ship's bell was added after the battle of Hampton Roads, so I chose to leave it out on my ship plan. Note how the gun ports have the shape of three intersecting circles. The intention was to bore the three holes and then shape the ports into the more expected oval. However, being of no practical consequence, only cosmetic, they decided to leave them unfinished to save time. The business-end of the 11-inch Dahlgren sisters. 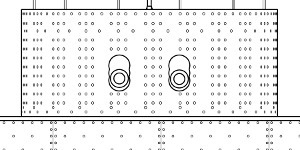 This is a detail from the USS Monitor plans that I drew up after several visits to the Monitor Center. Since the Monitor turret is still being excavated and documented, new discoveries continue to be made about its construction. Inside the museum there are two more turret replicas. One is showing the turret "as they found it" - it's upside-down and shows silt, barnacles and all. It's fascinating in its own right. The other is a full scale cut-away showing the internal structure, how it was driven and suspended and also the Dahlgren guns on their carriages. 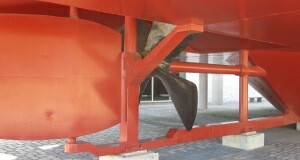 The propeller and rudder arrangement is another source for confusion for model ship builders. Here again is a picture from the full size replica. Note the vertical tubes (one intersecting the prop shaft, the other intersecting the upper part of the propeller pillow block); this is a structural solution for the replica, so it should not be represented on a model of the 1862 USS Monitor. You can walk out on the deck of the Monitor replica, and also access the hull from the ground level. This is a great opportunity to investigate the revolutionary skeg, rudder and propeller arrangement. Here is a detail of the propeller, shaft and rudder from my USS Monitor plans. 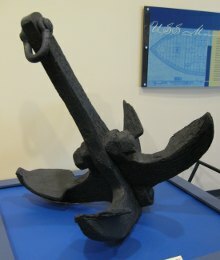 The anchor of the USS Monitor was salvaged and is on display near the entrance to the Museum. I didn't dare whip out the tape measure for this one. Luckily, at the time there was a free-standing, full size replica next to the ship. Parts of another replica is mounted in the anchor well on the USS Monitor replica. ...and here is the anchor as I drew it up on the USS Monitor plans.